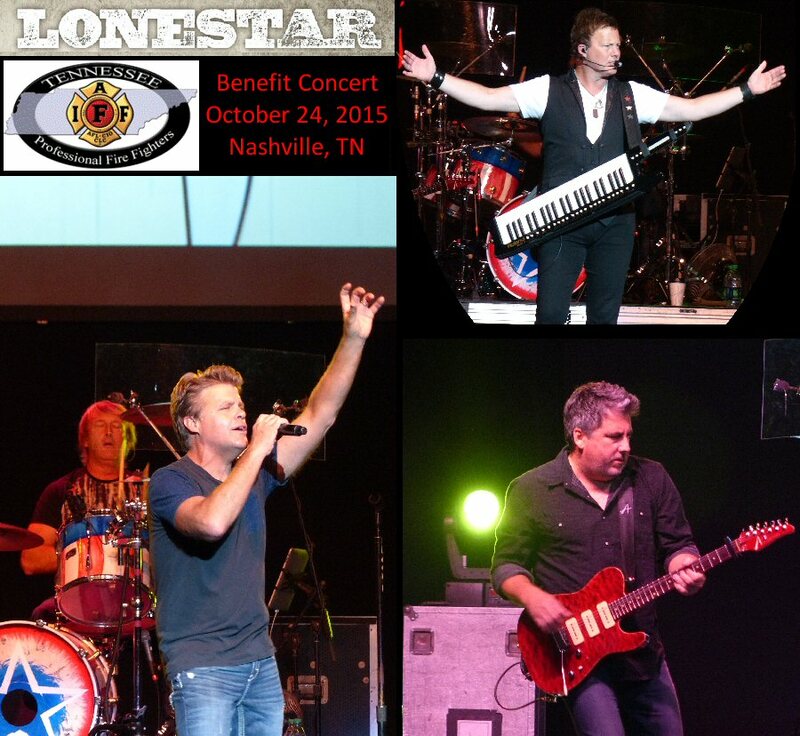 Lonestar the multi-platinum country music quartet met up at the Nashville Municipal Auditorium on October 24, 2015 for a concert to benefit the Nashville Firefighters Association Local 140. Lonestar’s roots are in Texas but the band members first met and formed Lonestar in Nashville, Tennessee. They came from blue collar backgrounds thus they valued hard work. An ethic that served them well back in 1992 when they perfected their skills playing in a bunch of bars before their successful self-titled debut album was released in 1995. Since then Lonestar has sold millions of records with ten #1 country hits to their credit including the cross over chart-topper “Amazed”. Lonestar originally hail from Texas but they formed in Nashville. Since this was a fund-raising concert, the general admission and arena seating arrangements were on a first come first served basis. Lonestar also hosted a meet and greet on Saturday night where we had the pleasure of a quick introduction with this personable quartet before the show. Over the stage at the Auditorium was a large screen used to project the group’s name. It was also utilized throughout the evening for video clips. The core four were supported by a bassist and a pedal steel guitar player. “Come on y’all,” singer Richie McDonald said as he encouraged the crowd to clap along to their catchy opening number. Richie was an effective frontman easily connecting with their audience. Throughout the night McDonald posed for selfies with enthusiastic fans. A number of times he signed autographs while singing a song. The rest of Lonestar was equally apt at their craft strutting their stuff during short but sweet instrumental solos. One of many reasons that Lonestar are stars is that they compose songs for the everyday man/woman. “Mr. Mom” with “sweet potatoes in my lazy chair” quickly appreciated how much his honey does in a day when he finds himself out of work and home with the kids. The historic Nashville Municipal Auditorium has hosted amazing concerts since 1962. The boys bantered a bit between tunes but at the right time they knew how to deliver a love song. 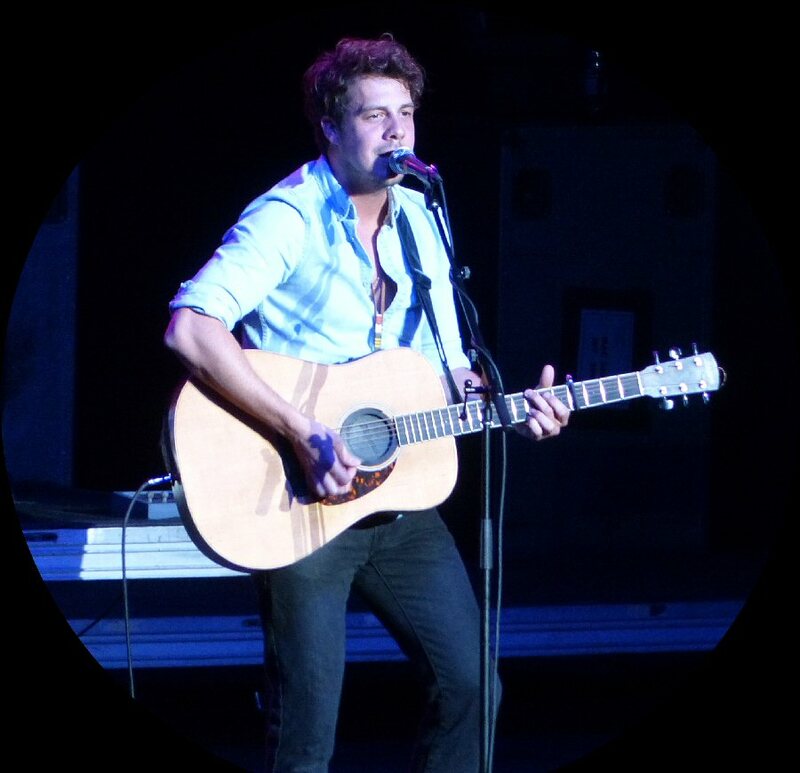 “You’re Like Coming Home” was beautiful lyrically combining country with rock stylings. “Come Cryin’ To Me” was another moving testimony of unconditional love. Richie made it a point to thank folks for making those singles popular. McDonald also shared that in their early days before they had their own hits people wanted to hear covers. With a nod to their history they performed the classic “Lyin’ Eyes” (The Eagles) a song that is certainly in their wheel house as was their feisty spin on “The Fireman” (George Strait) dedicated to firefighters – after all this was a benefit concert for Nashville’s bravest. As Richie surveyed the crowd he spotted a young fan and inquired after the child’s age (7). McDonald recalled his own son as the inspiration for “I’m Already There”. He sent the song out to all the military people, thanking them for their sacrifice. His words applied to so many circumstances – a person on a tour of duty or Lonestar on the road away from their families. This touching tune was a high point of the concert. Their energized version of “Walking in Memphis” (Marc Cohn) and a country flavored “Get Back” (The Beatles) was engaging even as more folks flocked to the front of the stage for selfies with Richie who did his best to accommodate everyone and carry the tunes at the same time. This show was a benefit for local chapters of the Nashville Fire Department. Lonestar quickly returned for their encore that featured the fan favorite “Amazed” followed by clips of classic rock songs starting with Pink Floyd’s “Brick in the Wall” which was interesting with the pedal steel floating into the mix. They completed the medley with the Kiss classic “Rock and Roll All Night.” Lonestar met up at the place where it all began for them with a mix of covers and originals reflecting the past and present for Lonestar as well as Nashville a city known for country music but a town that can rock with the best of them also. Opening for Lonestar was Kentucky native Brent Rupard who fronted a talented trio that presented a strong set of music. The skilled singer-songwriter who is now based out of Nashville played many quality original compositions along with a stirring cover of Elton John’s “Rocket Man” indicating that he’s just about ready to blast off. 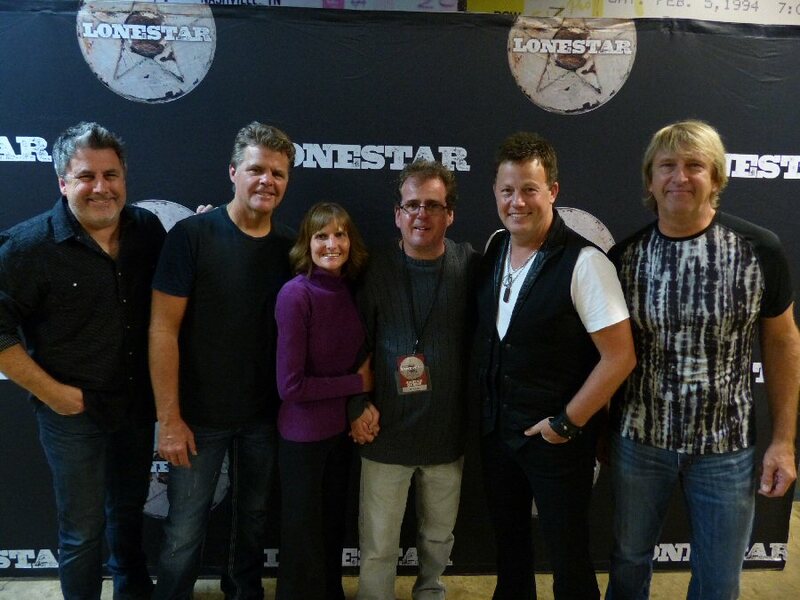 Rich and Laura get to meet the band Lonestar backstage. The Nashville Municipal Auditorium continues to hosts a wide array of artists such as Lonestar. The Auditorium was built in 1962 as a multi-purpose facility for music, religion and sports. Aerosmith to Willie Nelson have performed at this venue. Part of its long history is documented on its walls in the form of re-created ticket stubs. Hard to imagine paying $6.50 to see Bruce Springsteen but it was The Darkness on The Edge of Town tour (1978). The Nashville Municipal Auditorium is above The Musicians Hall of Fame an impressive museum that honors musicians ranging from sidemen to superstars. Both landmarks in Music City are worth a visit for both natives and tourists. Brent Rupard and his talented three-piece opened the show. Related Links: For more information on LONESTAR and the other organizations mentioned please visit the following links — Lonestar | Brent Rupard | Nashville Auditorium | Report from the Musicians H.O.F.